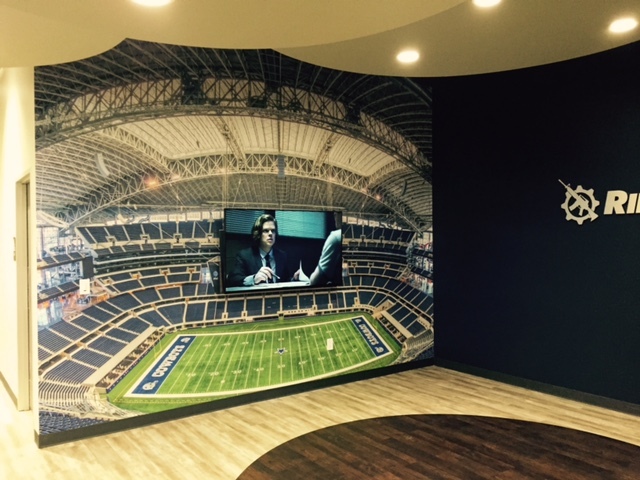 This wallpaper is a photo of the stadium where the Cowboys play, with the twist that the jumbo TV in the stadium is actually a real TV on the wall for watching the game! It makes a pretty cool man cave. Our suede custom printed wallpaper does a great job on this. The suede texture breaks up the glare of the lighting, and the colors are bright and happy. We print on a commercial grade vinyl wallpaper that is tough and scrubable. Important for a man cave. This entry was posted in custom wall murals and tagged athletic wallpaper, custom wall mural, man cave wallpaper, sports wallpaper. Bookmark the permalink. Love it . Can this be replicated if given a wall size and centered for a tv mount .